CYPRESS, Calif. -- Yamaha Motor Corp., U.S.A., has announced its new Viking EPS Side-by-Side (SxS) vehicle setting a new standard in the three-person multi-purpose SxS segment. Every Yamaha Viking is being manufactured exclusively in the U.S.A. at Yamaha’s factory in Newnan, Ga., for worldwide distribution. The new Viking was designed and engineered as a robust and high-capacity utility vehicle. It combines Yamaha’s most powerful four-wheel drive engine to date with a comfortable and confidence-inspiring three-person cab, precision steering and class-leading handling. The vehicle’s distinctive features make it the most off-road capable vehicle in its class and the only one with true three-person seating capacity, making it not only hard working but fun to drive on the farm as well as the trail. The Viking’s exclusive pass-through bucket seating features a unique off-set center position (set 5 degrees back) that improves comfort with maximum shoulder room for all three occupants. This is the only vehicle in its class with three-point seat belts for everyone, plus headrests all around, adjustable handhold for both passengers and a textured floorboard with dedicated foot wells. Its seating position even provides for more head room than competitive models without sacrificing critical ground clearance. All told, the Viking boasts the most comfortable and secure seating in its class. 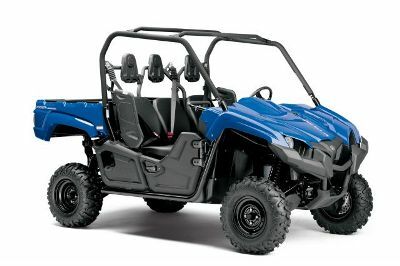 Power comes from Yamaha’s strongest four-wheel drive engine to date – a 686cc liquid-cooled 4-stroke, SOHC, single-cylinder, 4-valve fuel-injected engine that provides peak performance at maximum capacity. This durable engine has been optimized for working conditions with strong low-end torque while quick throttle response and smooth power delivery are maintained throughout the rev range. Yamaha Fuel Injection delivers consistent starts and power even at elevation and in cold weather, and the 9.7 gallon fuel tank allows for long days in the field or on the trail. A more powerful engine requires a more effective cooling system, and Yamaha has developed a system that keeps the Viking cool even during tough chores and at low speeds with optimum design, location and components that create the most efficient airflow through the large radiator. While the Viking’s 700cc-class engine makes more power than some larger 800cc-class machines, the vehicle’s handling and off-road capabilities truly set it apart. Yamaha’s three-way On-Command® system, featuring 2WD, 4WD and 4WD with differential lock, is a driver-controlled system with an automotive-type rotary dial selector. This driver-controlled system gives the driver the control and confidence to lock in all four wheels based on the terrain – a significant benefit over other automated systems on competitive models. Yamaha’s Ultramatic™ transmission with high, low and reverse has proven to be the industry’s most durable CVT system with dual speed gearing and an automatic centrifugal clutch that maintains constant belt tension for reduced wear and the industry’s most natural feeling all-wheel engine braking. This reduced wear has contributed to Yamaha’s proven durability, and the engine braking gives the driver confidence especially on hills and in rough terrain. The Viking’s optional Electric Power Steering (EPS) system provides the industry’s best balance of light feeling with positive feedback from the terrain. The system reads steering wheel torque, vehicle speed, On-Command setting and negative feedback to determine the appropriate amount of assist in any given situation. The Viking’s utility functions combined with Yamaha’s proven durability were designed for hard work, tough chores and long days in the field or on the trail. The rear steel cargo bed was purpose-built for durability and convenience. Large enough to carry a fully loaded pallet, the assisted dump bed can pack up to 600 pounds of equipment and supplies while the standard two inch receiver hitch is rated to pull 1,500 pounds. The Viking’s chassis also contributes to its off-road capability with nearly 12-inches of ground clearance at the lowest point, a full steel/composite smooth skid plate front to back and side to side, and an optimized frame with up-turned side rails allowing for smoother transitions over obstacles. The Viking features light and natural-feeling handling in both the EPS and non-EPS configurations. The front and rear suspension outperform the competition even with heavy loads. There simply is no more secure feeling vehicle when tackling rugged terrain – especially at full capacity. The Viking’s long-travel four-wheel independent suspension is perfectly balanced to provide a plush and comfortable ride with a quality damping feel in rough terrain all while carrying either a light or full load. The gas charged shocks help reach the delicate balance of damping and resistance with one or three people, fully loaded or empty. The all-new Maxxis Big Horn 2.0 tires were designed specifically and exclusively for the Viking with maximum performance and durability. The new Big Horns provide an optimized balance of sidewall and tread center stiffness in a tire that delivers an excellent combination of traction, precise steering and comfort. The Viking’s large diameter front and rear brake discs with dual piston calipers on all four wheels ensure good balance and power during braking – with or without cargo. The Viking also comes equipped with a mechanical parking disc brake. Little extras are a big deal when they help increase productivity and fun. Things like marine-grade electrical connections and wiring, a sealed maintenance-free battery, digital meter and easily accessible and serviceable foam air filter and engine are built into the Viking to help owners stay on task or trail – and out of the shop. The all-new Viking EPS and non-EPS models will be available starting this August. Standard models come in Steel Blue, Hunter Green (with sun top), Red (with sun top) and Realtree AP HD camo (with sun top). The non-EPS models start at $11,499 MSRP while the EPS models start at $12,499 MSRP. A Special Edition Tactical Black model will be available in spring 2014.